Solid: Please refer to available lace colors for Soft Tulle. **Metallic lace with the silver threading. 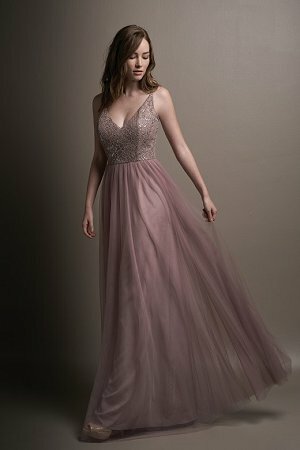 Gorgeous v-neck dress with a metallic lace fitted bodice and backless V along with a soft tulle, flowy skirt all in a beautiful sandbar color. *No extra length for all sizes.